Laini Kavaloski is a Ph.D. student in English and a DesignLab consultant at the University of Wisconsin-Madison. At their best, experimental spaces within the university inspire new fields of inquiry, cultivate new pedagogies, and make cross-disciplinary connections. 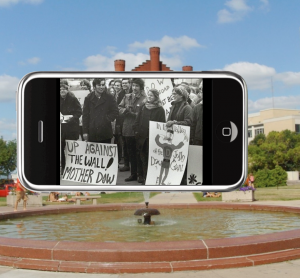 The innovative University of Wisconsin-Madison’s DesignLab was established in 2011 in order to improve the media literacy of students at the university and to serve as a space of inquiry and experimentation for media work. Indeed, the creative environment of DesignLab has fostered my own interest in the potential of media forms to intervene in political processes. As a graduate student in English and a TA consultant at DesignLab, much of my day is spent contemplating the affordances and constraints of media platforms with students and faculty across campus. In what follows, I give a brief introduction to DesignLab, and then I present a specific example of one of the creative media platforms that we are currently teaching. The author (left) meeting with another consultant in the DesignLab space. WHY? While print books and traditional papers remain the core texts of the university, assignments and research projects that utilize text, image, sound, and animation have broadened the ways we think about communication. Genres like video blogs, digital essays, and serious games are being leveraged more often to tell stories, to teach students, and to present research. WHAT? DesignLab is perhaps best described as a writing center for digital media projects. Led by Director Jon McKenzie (English) and Associate Director Rosemary Bodolay (Libraries) and housed in College Library, DesignLab helps students develop and communicate their ideas in media genres such as digital storytelling, interactive posters, and professional websites. 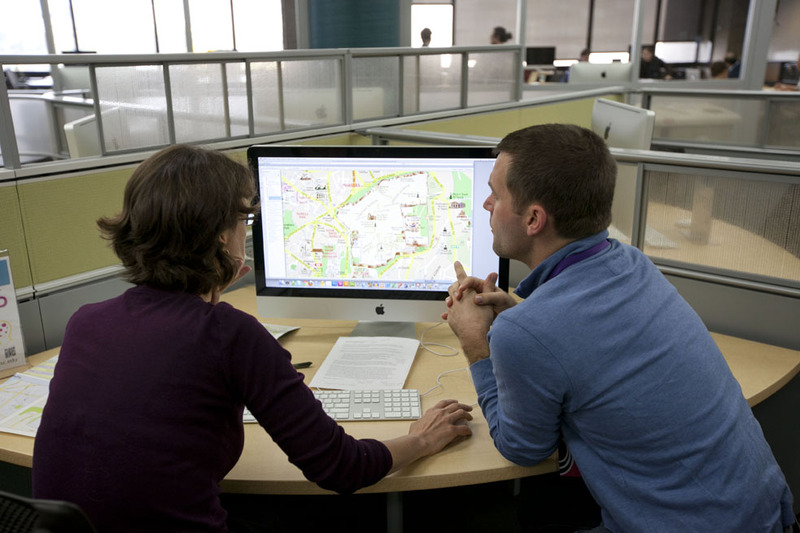 In one-on-one appointments, consultants at DesignLab help students and faculty use design concepts to support the content of their work in ways that are thoughtful, innovative, and relevant. HOW? When I consult with a client, I often begin by focusing on the conceptual and aesthetic aspects of the assignment by considering the interaction of the information architecture and the information design. I might do this by considering the hierarchy of information within the student’s work, such as the order of the navigation bar in a website, the arrangement of headings on a poster, or the story structure of a game. Equally important is the look and feel of a project; it is crucial that the design elements complement the content of a project rather than distract from it. Design elements include, the images, color, font, sound, and animation and their overall interaction within the media platform. 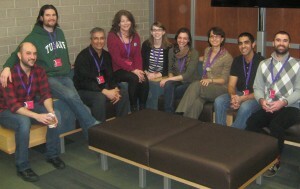 DesignLab consultants in 2013. Author is third from right. In addition to individual consultations, DesignLab also hosts Digital Salon, a digital museum installation of student projects, and fosters media literacy across campus. The experimental space of DesignLab encourages connections between different disciplines and at the same time cultivates creative teaching and learning practices such as the ARIS example below. One of the ways that DesignLab reaches out to the larger university community is through classroom instruction. DesignLab TAs teach six instructor workshops a year in addition to media literacy and design skills in their home departments. This past year I began working with Augmented Reality Interactive Storytelling (ARIS), both in instructor workshops and in English classes. At DesignLab we like to experiment with new media platforms as they come to our attention. ARIS is one of those platforms. Developed at UW by the Games Learning Society group and DoIT Academic Technology, ARIS is an open source web-based tool that utilizes a combination of story elements and GPS (Global Positioning System) mapping to create a locative, augmented reality experience. ARIS puts fictional, historical, or theoretical content onto a specific location on a map, which appears to the player when they enter a designated space. An image from an ARIS situational documentary, “Dow Day.” Photo permission by David Gagnon. ARIS has provided a new way for me to think about narrative structure in an interactive learning environment. Augmented reality GPS-based platforms imbue location with new dynamic experiences and generate multiple meanings within a specific geographical location. The text, image, and animation on the screen, project layers of meaning onto a particular space, thus transforming a seemingly static spatial environment into a kind of palimpsest, making abstract ideas or histories immediately experiential and relevant. Currently Professor Jon McKenzie and I, in collaboration with the Mobile Learning Incubator, are exploring ways that abstract theoretical concepts can be situated or located in real spaces. In Eng 550: Studies in Criticism our students are using the concepts and information architectures of theory comics to build games in ARIS. For example, one group may decide to use post-colonial theory to animate the paradoxical histories of Bascom Hall, an historic and iconic building on the UW-Madison campus, so that as the player walks through the building with an iOS device, they can engage with Bascom Hall’s paradoxical histories of colonialism (e.g. its placement on effigy mounds) and democracy (e.g. its history of land grants and public education). As you can imagine, locative-based game design has particularly exciting possibilities for learning. For example, as a student builds a game, she is compelled to think about the ways that the story structure (the narrative development/divergence, the pathways of the game, the conceptual architecture) and the design elements of the game (sounds, images, colors) affect the structures of knowledge within the game, the story arc, the affective augmented environment of the player, and the learning outcomes that result from these combination of choices. As students craft stories or experiences for other users, they reflect on the processes that affect the ways they think about and perceive the world around them. DesignLab provides a space where the university community can grapple with the affordances and constraints of new media forms and with their relationship to pedagogy, interdisciplinary practices, and various area studies. For me specifically, DesignLab provides a forum for thinking about and experimenting with the interplay between theory, narrative structure, and media form. Just as language can be used as a political tool, so too digital media platforms often lend themselves to a radical potential that is materialized as artistic process intersects with theoretical innovation. I would like to hear how your campus or department is experimenting with new media forms and digital studies. Laini – This is an excellent representation of DesignLab, very accessible. The visuals are engaging, although we should certainly get an updated Designlab photo! Great post Laini, the 550 project is really exploring the intersection of design, place and representation and I’m glad to be part of it. Laini gives a great description of the reciprocal learning and experimenting that occurs in DesignLab. 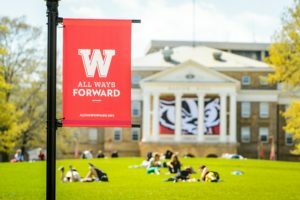 While the DesignLab consultants (graduate student Teaching Assistants) are delivering service to the UW-Madison community, the TAs are also learning and developing professionally through their experiences of working with people and content from across the many disciplines on the UW-Madison campus. Thanks for this post, Laini! I often wonder what goes on in DesignLab as I pass through on my way to meetings. As we’ve discussed before, I often use multi-media projects in my classes (I had several former students submit to the Salon this year) and frequently recommend this service for support. 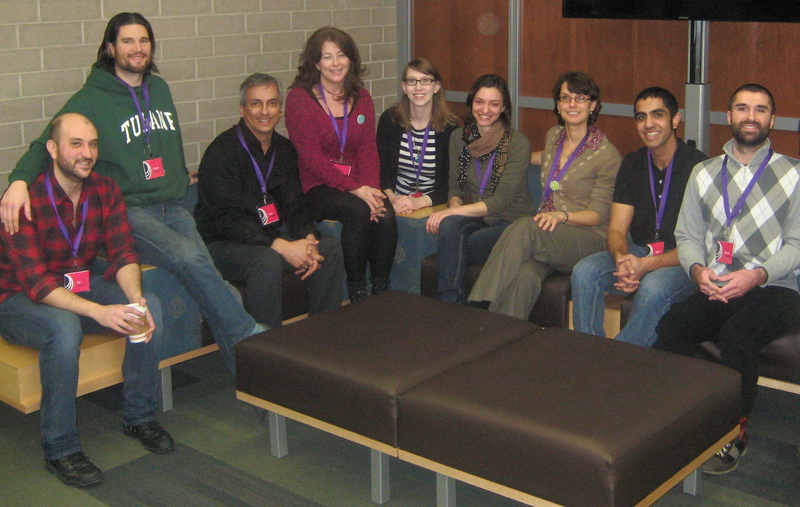 Do DesignLab TAs come to classes and do outreach? I’ve found that outreach opportunities foster more interest from students than just me telling them about a service. ARIS sounds like a great teaching and learning tool, especially with all the composition classes geared towards exploring space and place right now. Thanks for this really interesting introduction to the DesignLab, Laini! It sounds like some exciting work is happening there. You mention that the DesignLab is like a Writing Center for multimedia projects, so I’m curious about some of the similarities (or perhaps differences) between the way the two learning environments work. I’m thinking in particular about the balance between collaboration and direct instruction that we’re always negotiating in Writing Center sessions. While we strive for collaboration and often favor a more facilitative instructional style, there are some times when students benefit from direct instruction — for instance, I might explain some of the conventions and aims of the personal statement genre, or how and why topic sentences can help guide a reader through a complex argument. The way you describe the work you do in the DesignLab also sounds like it favors collaboration; similar to Writing Center instructors, you model an audience for students and help them think critically about how to best communicate with and appeal to readers/viewers/users of their projects. What I’m wondering is, how often do students come to the Lab looking for more direct instruction, and how do you approach those requests? Do you expect students to come to DesignLab already comfortable with the ins and outs of the technology they’re using and the basic conventions of the media in which they’re working, or do you help them develop that familiarity? How do you balance teaching students how a particular piece of software works or how a well-designed website works on a functional level, vs. teaching them to create rhetorically and aesthetically effective works within a new medium? Excellent writing Laini! Descriptive, clear, comprehensive, and left me with a real sense of what media literacy means for our current and future educational landscape. Well done! Thanks for your questions, Mattie. Yes, at DesignLab we do often negotiate the instruction of technology with that of the aesthetic and conceptual aspects of student projects. So while DesignLab focuses primarily on the the structure and look and feel, students do sometimes ask for help with the technical elements of a project. When we have time, we give as much assistance with software issues as we can, but often we refer clients to Software Training for Students, the Digital Media Center, or Lynda.com. (We are so lucky that UW-Madison has a robust support system for technical training and assistance! ) Indeed, one of the ongoing challenges of DesignLab is making clear to our users the distinction between design elements and technical software training. Great discussion. Two things that I hope DesignLab can support in the future: 1) helping students learn to design innovative software as well as use it; and 2) helping students move from only thinking about interviewing with companies and non-profits to also thinking about starting them. It’s wonderful to see how far the support for design and digital media projects has come since I graduated in 2010, with the savvy direction of Jon McKenzie, the Libraries, and the support of the Writing Center. This is a model for us at the University of Pittsburgh. Thanks for the profile, Laini! Laini, great post. The projects from your English 550 class sound really fascinating. I really love this idea of using ARIS to provide alternative histories for spaces. Are these projects going to be focused on the UW Campus? That’s such a great way to get students to engage with their own place of learning at a more complex, wider-reaching level. I imagine that a place like DesignLab can really offer students more training in program-usage as well. That’s always been the setback (albeit minor) when I use digital tools for assignments in my own classroom. I’ve done a class blog, a wiki-page, Flash projects, etc. and the hangup hasn’t necessarily been making sure each student has a solid understanding of the software or the tool. Rather, it’s been making sure each student understands that that kind of training is not a digression from the course but part of what I want them to learn. I taught an English 100 course on remix culture in the old digital studio, and learning to use web-based tools and digital media was just as integral to the course design as any of the readings or assignments. We were learning the processes through which remixes were made. Even then I had to do some extra justification for software training in an English class. I’m wondering if you or others run into this at all. I wish I could teach that course or something like it again after reading your blog post. Looks like DesignLab is doing great things. I’m definitely looking into ARIS now! Thanks! As a professor just getting used to thinking about how to bring digital technologies into the classroom, this was an incredibly helpful post. As you point out, this has incredible possibilities for engaging with cultural history (and the constructions of history), storytelling and questions of narrative structure, and of course a wide range of other disciplines. Thanks for detailing some of the exciting work happening at DesignLab — this really gives me a sense of some directions to go in in my own classrooms.